This is the first post in a series dedicated to our most loyal customers. When we sat down and wrote about the history of the Mecca for our history page, I kept thinking about the cast of characters who I got to know in the ’80’s and ’90’s. There were dozens and dozens, and I can probably rattle thirty of them off the top of my head right now, like Garry Dornburg, “Zero”, “Coal Man”, Phillip, “Wolfpack”, and Larry the Painter. It dawned on me that (***Cliché alert***) it’s our people who make us who we are. Not just because they keep us in business, but because they lend us as much character as our wood booths and our neon sign. The first customer we’re featuring is Ricky Foster, who has been a regular for about eight years. 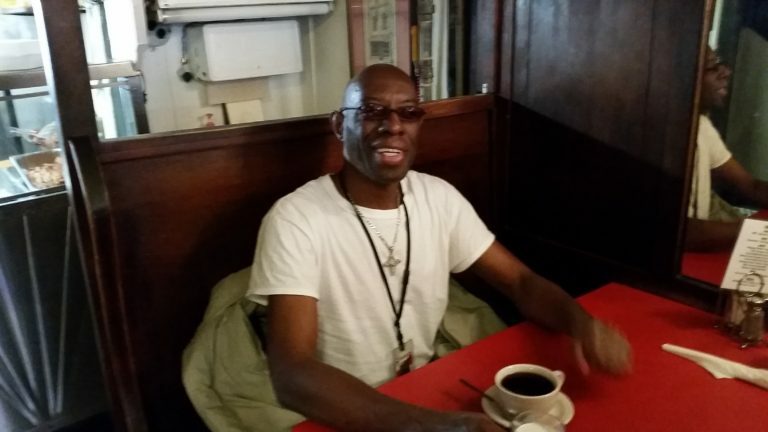 Ricky works at the South Wilmington Street Center, a county-run emergency and transitional shelter for homeless men. He heard about us through word of mouth, and decided to pay us a visit to see what the oldest restaurant in Raleigh was all about. He doesn’t remember what he had that first time, but does remember feeling the staff and atmosphere were “pleasantly welcoming.” Ricky’s favorite Mecca meal is the beef liver, smothered in onions over rice and gravy. Yum. The last question we asked or Ricky: if someone were thinking about coming in to eat at the Mecca, and asked your opinion, what would you tell them? His answer: “That they will not be disappointed.” Thanks, Ricky, for eight years of business, and for being such a loyal advocate!